King County monitors the ecological health of Mill Creek in a variety of ways, including collecting and analyzing water, sediment, and benthic invertebrate samples. Station A315 is located at the bridge at 68th Ave and South 261st Street. Water quality samples were collected from 1979 to 2008 when budget cutbacks forced King County to reduce the breadth of its water quality monitoring program. Sampling at this site resumed in February 2013. Beginning in 1987, sediment quality samples have been collected from this site. King County began collecting benthic macroinvertebrate samples in 2002 to monitor stream health. From time to time, additional studies have been conducted on Mill Creek. Click here for information about Special Studies. The Mill Creek watershed (sometimes referred to as Hill Creek in literature) is located in South King County in WRIA 9. The watershed is roughly 22 square miles in size and includes portions of the cities of Kent, Auburn, Algona, and Federal Way (Kerwin and Nelson, 2000; Herrera, 2005). The creek originates from Lake Doloff and Lake Geneva in the west Green River Valley and flows through the steep Preasley Canyon before entering the Green River at river mile (RM) 23.9. The creek is approximately 8.35 miles long (note: there is another Mill Creek located within WRIA 9 that drains into Springbrook Creek further downstream on the Green River). Historically, Mill Creek has served as an important flood storage area as water is conveyed from nearby wetlands to the Green River (Kerwin and Nelson, 2000). The creek has provided important refuge for fish during periods of high winter flows. Several studies related to flood control have been produced in the last 40 years (Kerwin and Nelson, 2000). Approximately three-quarters of total land use in the Mill Creek basin is developed (low to high intensity and open space). The remaining land use is mostly forest and agriculture. Forested areas consist of deciduous, evergreen, and mixed. Agriculture is mostly pasture/hay, but some land is used for cultivated crops. There are also wetlands, as aforementioned, and small amounts of scrub and other (barren land, grassland, and open water). See Table 1 below for more details on land use. Coho, chum, and winter steelhead have been observed spawning in Mill Creek. Juvenile coho, chum, winter steelhead, cutthroat, and Chinook have been captured in the creek (Kerwin and Nelson, 2000). The Lower Green River Baseline Habitat Survey Report (Anchor Environmental, 2004) provides detailed information about fisheries habitat conditions in the Mill Creek area. State water quality standards were revised in 2003. Mill (Hill) Creek is now categorized as “Salmonid Spawning, Rearing and Migration Habitat” for aquatic life use, and “Primary Contact” for recreational use. As part of the updated water quality standards, portions of Mill Creek have been assigned an additional “Supplemental Spawning and Incubation Protection” temperature criteria of 17.5 °C. The creek is on the Washington State Department of Ecology’s (Ecology) 303(d) list for violation of FC bacteria, zinc, pH, and bioassessment standards (Category 5). The creek has an EPA-approved Green River Temperature Watershed total maximum daily load (TMDL) plan in place and implemented (Category 4a). A 25-year (1979 – 2004) trend analysis was conducted with water quality data collected from the mouth of Mill Creek. This analysis shows some improvements in water quality since 1979. Turbidity, total suspended solids, ortho-phosphorus, total phosphorus, ammonia, nitrate-nitrogen, and FC bacteria have all shown a significant decrease; and DO concentrations have increased significantly in this 25 year time period. In contrast, pH values have shown a significant decrease, but have remained within acceptable range relative to the state standards. While these trends indicate improvements in water quality since 1979, another water quality data assessment conducted for the Green-Duwamish River in 2003 found that Mill (Hill) Creek still had low DO concentrations and high ortho-phosphorus and FC bacteria counts relative to the rest of the Green-Duwamish watershed (Herrera, 2005). King County operates two stream gages on Mill Creek: Mill Creek at SR 181 (41a) and Mill Creek at Peaseley Canyon Road (41c). 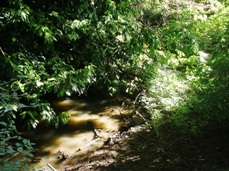 In 2010, eight samples were collected along the Mill Creek reach in the City of Auburn, Washington. Arsenic concentrations at sites ED315, FR315, TS315, and UH315 exceeded the Sediment Cleanup Objective (SCO). This means adverse effects in benthic animals are possible, but uncertain. Concentrations of bis(2-ethylehexyl)phthalate (a ubiquitous chemical found in many plastics) also exceeded the SCO at sites ED315, FR315, PR315, and TS315. Another phthalate, di-n-octyl phthalate, exceeded the SCO at site FR315. Nickel concentrations exceeded the SCO at sites PR315 and UH315. Additional data (acid volatile sulfide/simultaneous extracted metals ratio) suggests that among sites where metal concentrations exceeded the SCO, metals are only bioavailable at FR315 and PR315. For more information about benthic macroinvertebrates and King County’s Benthic Macroinvertebrate Program, please visit the King County Stream Bug Monitoring webpage. To see the benthic macroinvertebrate data for Mill Creek, please visit the Puget Sound Stream Benthos webpage. Pyrethroids are a group of synthetic insecticides commonly used in residential areas. Residential and commercial use has resulted in an increased detection in urban runoff, which can be harmful to aquatic life. In October 2014, a pyrethroid survey was conducted in sediments collected from six King County streams. These streams include: Juanita, Forbes, Thornton, Pipers, Springbrook, and Mill Creeks. Results found that bifenthrin was the only pyrethroid detected in the sediment samples; and most detected concentrations were below the reporting detection limit. Percent finds and TOC content, which varied substantially by creek, may be influencing bifenthrin detections. These results suggest that sediments may contain toxic levels of pyrethroids even if they are not detectable above detection limits in this study. In 2001, King County initiated a separate comprehensive study of the Green-Duwamish Watershed, called the Green-Duwamish Watershed Water Quality Assessment (GDWQA). Several reports evaluate data collected as part of the GDWQA. Mill Creek is included in this analysis.